This body of work is a series of investigations into visual representations of time. Using the chance discovery of player piano rolls as a point of departure, I make paintings, prints and collages on scrolls. While transforming the scrolls, I make connections across continents, cultures and periods of time. The scroll format and quaint, overtly sentimental lyrics of the piano rolls lend themselves to a dialogue that highlights the passage of time, cultural distance and technological change. I make work responding to these artifacts as an outsider to produce new meaning and merge my own memories into the history these objects embody. My work leads me to ponder how I experience rhythm, time and memory in everyday life. 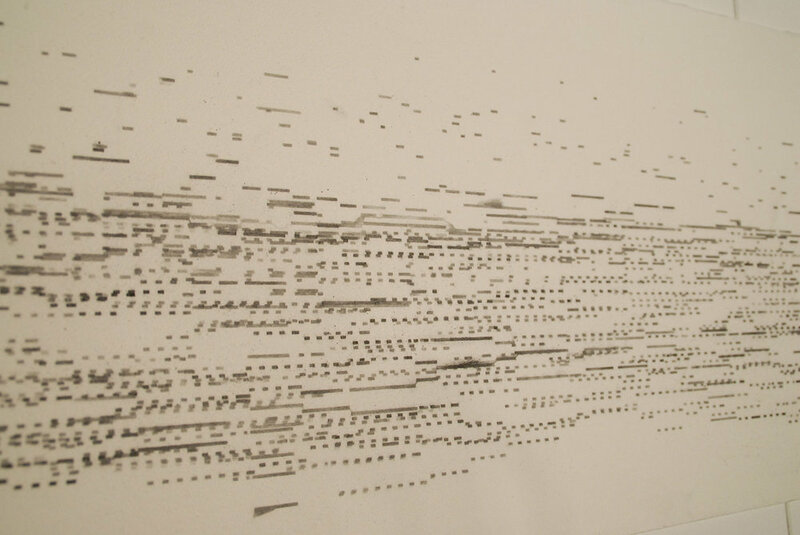 The piano rolls serve as containers to embody this examination. I consider visual materials to be records of the past. They function as archives that continue to modify within us as memories- a dense accumulation of data that reverberates and resonates depending on one’s perspective. Memories interject, inform, intrude and integrate into our daily lives and lead to a layered experience of time. In this work, I explore this complexity of time and memory.